Not since the days of the First Doctor, had three seperate companions travelled with the Doctor for an extended period- all at one time. With Adric, Nyssa and Tegan, it meant that – for a while, the Tardis was full and had to generate a number of extra bedrooms to cope with the extra contingent. As per the three companions, you couldn’t of had a more different trio – in terms of character, diversity and outlook – and at times all three jockeyed for position in the stories as a kind of power struggle took place, to be ‘head companion’. The Alzarian Boy mathematical boy genius with a touch of Artful Dodger! Adric (Matthew Waterhouse) was a Alzerian teenager from an alternate universe known as E-Space. His family was dead and he roamed the Alzerian swamps in a teenage gang. His character was originally written as a space version of the Artful Dodger but in practice came over more like a precocious mathematical genius. The Alzerian’s were more adaptable than their human counterparts, having the ability to rapidly evolve. They were stronger – and healed quicker from injury, than their human counterparts. The Alzerian’s had apparently crashlanded on Alzeria, from whereabouts unknown. They used their crashed spaceship as refuge from the aquatic gill-men of the swamp, who made for land during the seasonal “mistfall”, in Full Circle – 1980. It was here, that Adric met the Fourth Doctor and companions Romana and K9. Who themselves were stuck in the alternate reality of E-Space and were atempting to get back to N-Space. They also uncovered the hidden truth that Adric’s race had evolved directly from the Marshmen and the crashed ship that had apparently bought them, was actually a lie; built to make the Alzerian’s believe they were off-worlders. Adric stowed away aboard the Tardis and for a time travelled with Romana before leaving E-Space with the Doctor to N-Space. After the Fourth Doctor regenerated into the Fifth Doctor, Adric found himself travelling as a foursome – with Nyssa and Tegan. His relationship with the two girls was something of a disapproving big sisterly affair but he grew close to the Fifth Doctor, who was more open with him than his predecessor had been and even showed Adric elements of Tardis operation. Adric was a brilliant mathematician but he was incredibly naive as he was led by logic. It was in Four To Doomsday that Adric was persuaded to help Monarch with a strong logical argument, that Adric could not see was manipulation. In Earthshock – 1982, Adric found himself at the centre of a Cybermen led plot to destroy primitive life on Earth and he sacrificed himself to detonate a huge space freighter in the atmosphere, which was credited as killing off the Dinosaurs and eventually allowed the human race to evolve. Adric had been fond of wearing his gold Sheriff’s badge and it was this badge that the Fifth Doctor used to dispatch a Cyberleader, by jamming it in into his breathing apparatus. The Fifth Doctor felt guilty for having removed Adric from his own Universe and upon regenerating into the Sixth Doctor in Caves Of Androzani – 1984, uttered “Adric!” – as his final words. Nyssa, (Sarah Sutton) was a young female Trakenite from the planet of Traken, whose home was destroyed and parents killed, by the Master. Nyssa’s father – Tremas, was killed by the Master and his body was stolen and possessed in The Keeper Of Traken – 1980. As a result of the Master’s actions, a being known as – “The Watcher” transported Nyssa to planet Logopolis to meet the Fourth Doctor again, in Logopolis – 1980. Nyssa requested that the Doctor take her with him to see the Universe but more secretly Nyssa wished to see and save her possessed father – somehow, from the Master. She was a brilliant Biochemical Engineer and the Doctor found her useful time and time again for getting out of a scrape. She had experience of flying the Tardis, (as Adric did) – but she was definately a more rounded intelligence than Adric due to being more street smart. Nyssa was to meet her double in the universe, on 1920’s Earth – young high society flapper – Ann Talbot in The Black Orchid- 1982 Who was confused for and replaced her human counterpart for a time. Nyssa left the Doctor in Terminus – 1982, after contracting a disease on board a space station where (once treated) – she decided to stay behind and help the Scientists look for a cure. Tegan Jovanka (Janet Fielding) was an Australian female from Earth and Gatwick flight stewardess, who made the mistake of wandering into the Tardis in Logopolis – 1980 on her way to work, believing the Tardis to be a real phone box. Tegan wasn’t particularly happy to be stuck travelling with the Fourth Doctor and wanted to return to Garwick to make her flight. The Fifth Doctor made several unsuccessful attempts to return Tegan to Gatwick in her own time, usually missing the mark considerably Four To Doomsday – 1982, The Visitation- 1982 and Time Flight – 1982. – the latter saw Tegan finally returned to Heathrow, in the correct time period eventually. She wasn’t particularly gifted when taken alongside the alien intelligences of Adric and Nyssa. However, Tegan was more an important anchor to Doctor Who due to being a plot device who could request and illicit a simple explanation or response from the Doctor, Adric and Nyssa; when the Davison-era Who got scientifically muddy. Tegan had a run in with a powerful snake-like entity – called the Mara, which possessed her in The Kinda – 1982 and re-establishrd its link again in Snakedance – 1983. Tegan was brash and short tempered and frequently bickered with Adric, Nyssa and later Turlough – who she mistrusted intensely. But this was a really a coping mechanism to deal with the adventures she found herself in. The Doctor frequently comforted her by calling her “Braveheart – Tegan!”. After returning to her correct time period, Tegan got fired from her stewardess job and rejoined the Fifth Doctor’s crew again, bumped into him in a Dutch airport in Arc Of Infinity – 1983 . 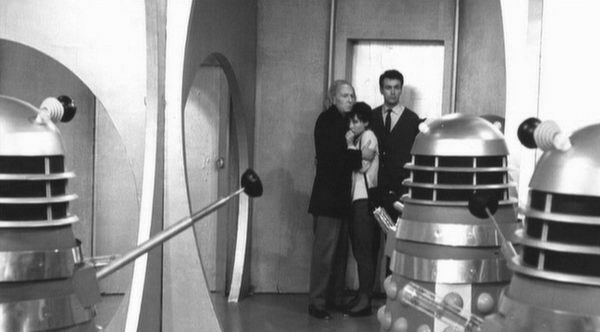 She eventually left for good after the battle between Human and Dalek’s in Resurrection Of The Daleks – 1984, sickened by the carnage and needless waste of life.